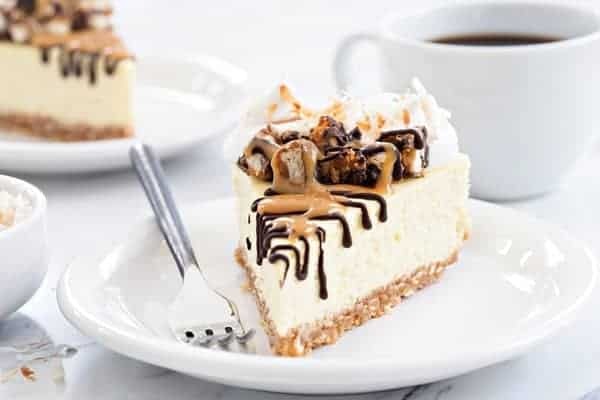 Samoa Cheesecake starts with a coconut shortbread crust and is topped with whipped cream, toasted coconut, melted chocolate and gooey caramel. Yes, it tastes as good as it sounds. I thought I was going to make it through 2017 without being tempted by Girl Scout Cookies. You see, this girl has a real thing for Samoas, Trefoils, Thin Mints and Do-si-dos, but no one came a knocking this year. Since I’m trying to focus a little more on my diet, I can’t say that I was too disappointed, because let’s be real, I can polish off a sleeve of Thin Mints during one episode of Golden Girls. However, about a month ago, my aunt sent me a text asking if we were interested in buying a few boxes because her friend’s daughter had about 10 leftover that she needed to sell. And of course, without hesitation, I quickly messaged back my requests. 20 minutes later I was the holding a bag with 2 boxes of Thin Mints, 2 boxes Samoas and one box S’mores – because S’mores. Elle and Eric wasted no time popping the Thin Mints into the freezer and noshing down on them that evening. I, however, left the Samoas sealed and hidden from clear view in the pantry for weeks. 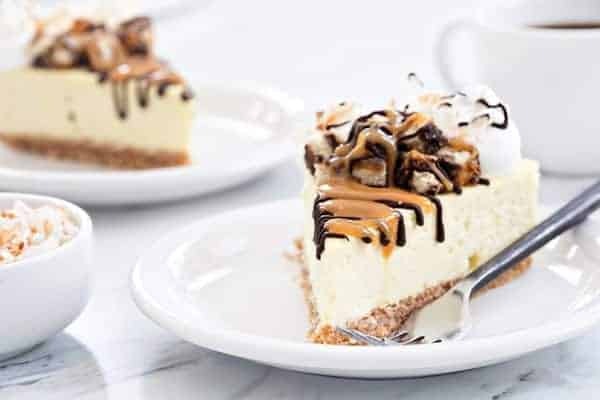 Until I decided that I was in the mood for cheesecake – Samoa Cheesecake to be exact. I decided to create the crust out of crushed shortbread cookies, but I couldn’t get my hands on any Trefoils, so I opted for a bag of a Pepperidge Farm Shortbread cookies. Since I was making a Samoa Cheesecake, I decided to add shredded coconut to the crust, which was pretty genius if I do say so myself. The cheesecake filling was my standard favorite combination of cream cheese, sugar, eggs, vanilla, and a bit of heavy cream, but with an added splash of coconut extract to really pump up the coconut flavor. For the toppings, I may have gone just a tad overboard with whipped cream, chopped Samoas, gooey caramel and of course, a drizzle of melted chocolate. 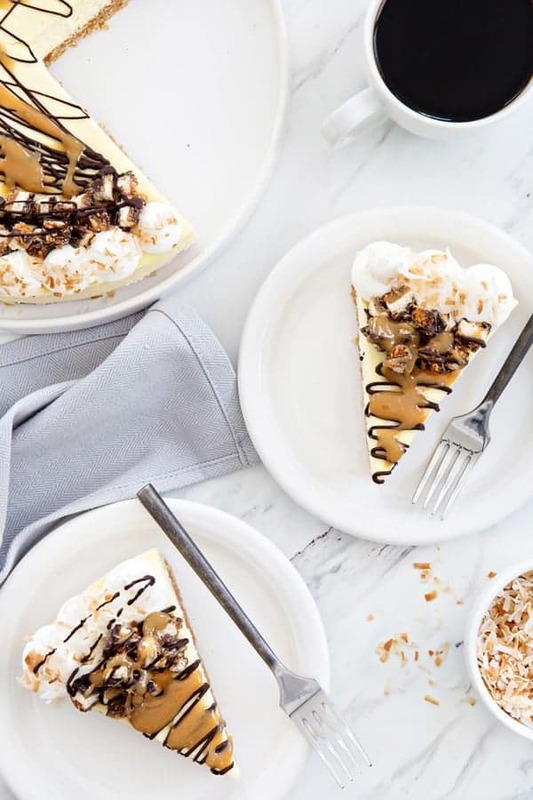 I mean, if you’re going to make a Samoa Cheesecake, you might as well go all the way, right?! I find that people are really intimidated by making cheesecake at home. But honestly, the process is super simple. Sure, you might end up with a crack here and there – especially if you don’t use a water bath, but it will still taste amazing. And you can always cover the crack with fresh fruit, whipped cream, or even a can of cherry pie filling. Make sure your cream cheese is at room temperature. It should be super soft before incorporating it with the other ingredients.I find that full fat cream cheese creates the best texture, so that’s what I always recommend. It also doesn’t hurt to have your eggs and heavy cream at room temperature as well. You’ll want a smooth batter, so be sure to scrape down the sides and bottom of the bowl as you’re mixing the ingredients. Just be sure not to over-mix.Once the ingredients are incorporated and the batter is smooth, you’re good to go. Use a water bath. This process is super simple and shouldn’t be skipped. Simply wrap the bottom of your springform pan with a couple of layers of heavy duty foil so water won’t seep in.I often add a another layer of protection by placing my springform pan into an oven bag, but this step isn’t necessary if you wrap the pan tightly with foil. Once you’re ready to bake your cheesecake, place the wrapped pan in a large roasting pan and pour hot water into the roasting pan, about halfway up the sides of cheesecake pan. Once your cheesecake has baked for the directed amount of time, it should still have a slight jiggle in the center, kind of the way Jell-o jiggles, but the edges should be pretty set.Once my timer dings, I turn off the oven and I lay a piece of foil across the top of my pan. This will prevent the cheesecake from becoming too brown. Now, I crack the oven and let the cheesecake rest in the oven for 1 hour before removing it to a cooling rack to cool completely. Once your cheesecake is at room temperature, I recommend placing it into the refrigerator for no less than 8 hours. Will allow the cheesecake to chill thoroughly. When you’re ready to slice your chilled cheesecake. 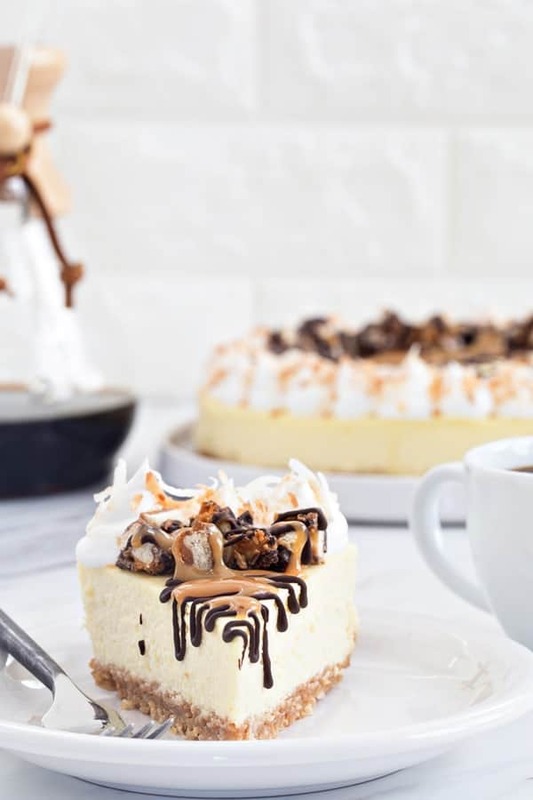 Dip your knife blade into hot water for about 30 seconds, then carefully wipe it dry with a towel.This will heat the knife and allow it to glide through the cheesecake with ease, creating ultra-clean slices. Repeat this process for each slice. If you’re looking for a low-carb version, this Low Carb Cheesecake is perfection. For more Samoa inspired treats, be sure to check out my Frozen Samoa Pie, Gluten-Free Samoa Cupcakes and Samoa Popsicles. Preheat oven to 325°F. Tightly wrap a 9-inch springform pan in two layers of heavy duty foil. This step prevents leaks when using a water bath. I also take the extra step of placing the foil wrapped spring form pan inside an oven bag while baking, but this is optional. Place cookies and shredded coconut into a food processor and pulse until fine crumbs are formed. Add in the melted butter and pulse until it is fully incorporated into the cookie crumbs. Press the crumb mixture into the bottom of the prepared pan. Bake for 8-10 minutes and cool completely on a wire rack. Begin a kettle of water to boil for the water bath. In the bowl of your stand mixer fitted with the paddle attachment, beat the cream cheese until smooth. Add sugar and mix until combined. Scrape down the sides and bottom of the bowl and mix again before adding the eggs. Add eggs, one at a time, fully incorporating each before adding the next. Make sure to scrape down the bowl in between each egg. Add heavy cream and extracts, and mix until smooth. Pour batter into prepared crust. Place pan into a larger pan (I use a roasting pan) and pour boiling water into the larger pan until halfway up the side of the cheesecake pan. Bake 55-65 minutes, the edges will appear to be set, but the center will still have some jiggle to it. At this point, turn off the oven, lay a piece of foil over the top of the cheesecake and leave the oven door cracked. Allow the cheesecake to rest in the cooling oven for one hour. 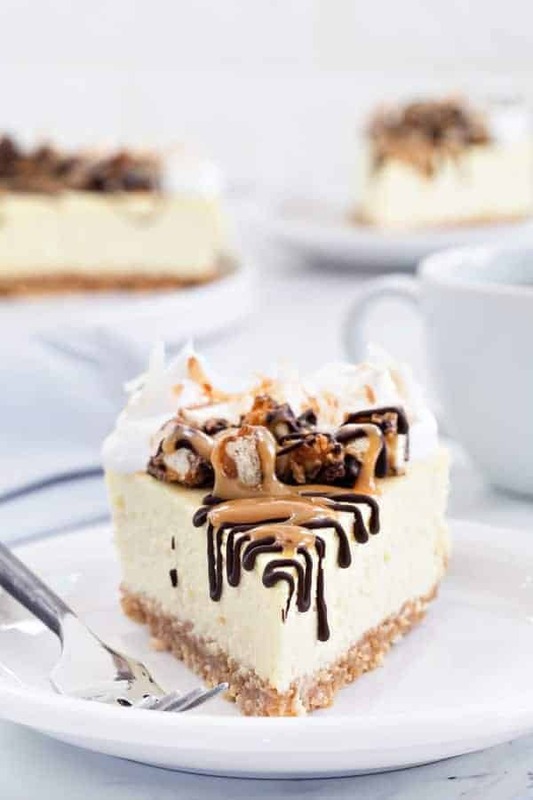 Just before serving, top the cheesecake with whipped cream, chopped Samoa cookies, melted chocolate and toasted coconut. Check out my post on how to toast coconut if you need some tips. Oh the days of when my daughter was a Girl Scout! Hiding them in the pantry…I thought I was the only one. 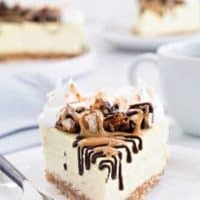 I love the coconut cheesecake idea. Looks so fluffy and delicious. Let me know how you like it, Roseanne! Oh gosh, this CHEESECAKE!!! There really aren’t words. So yummy! I love it and I can’t wait to try this. This would be a perfect birthday cake. Thanks! You’re welcome, Megan! Let me know how you enjoy it! This looks AMAZING!!!! I can’t wait to to try this. As always, thanks for the great baking inspiration.